le chaudron de vulcain – October 03 , 2017. EN. Sakurajima ( Aira) , Ambae , Cleveland , Sabancaya , Plateau of Dieng . Home / aira / October 03 , 2017. EN. Sakurajima ( Aira) , Ambae , Cleveland , Sabancaya , Plateau of Dieng . 2 OCTOBER 2017. 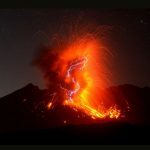 On September 29 and October 1 at the Showa crater, of Sakurajima volcano, near Kagoshima City, the 72nd and 73rd explosive eruptions of the year, were observed. The 72nd eruption, at 05:55 am on 29th the plume was 2800 meters, the 73rd eruption at 9:35 pm, the plume rose to 2300 meters. Ejecta was scattered from the Showa crater to 800 to 1300 meters. 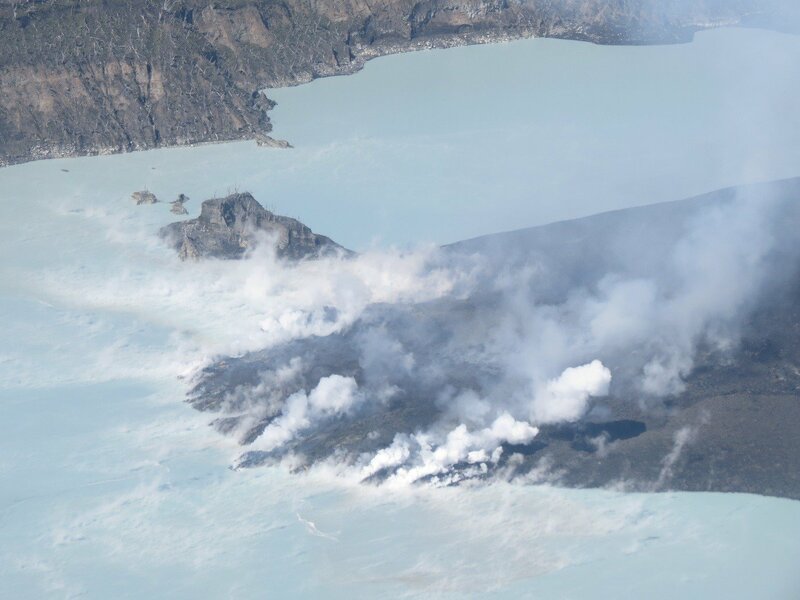 According to the Meteorological Agency , although the eruption warning level 3 (restriction on entry into the mountains) is continuing, the supply of magma continues deep underground of Aira caldera (northern part of Kagoshima bay), there is a possibility that the volcanic activity will continue in the future. 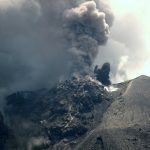 It is said that there is a risk of continued explosive eruption accompanied by large burning stones that scatter more than 1 kilometer from Minamidake summit crater and Showa crater and small pyroclastic flow. In September Ambae volcano started to wake up and the VMGD raised the Volcanic Alert Level for the volcano to Level 3. It was not clear how the eruption would develop. The volcano then entered in to an explosive phase, building a tuff cone in the lake. Some of the larger events generated tall eruption columns above the island and local ash falls. This was expected activity, based on the historic activity seen at this volcano. The eruptions in mid-September 2017 are the same as those in 2005, the same type of eruptions were seen this time as in 2005. Some parts of the island experienced ashfalls from this type of eruption. Aerial view of the volcanic cone that has formed in Lake Vui during September near the summit of Ambae Island. The active lava producing vents are near the centre of the island. The blue steaming zone is a lava flow. The white steaming to the right is lava enter the lake. The style of the eruption then changed around 22 September when Geohazards staff observed lava at the surface for the first time. This was a significant change and raised the level of uncertainty about the development of the eruption. The volcanic Alert Level was also raised further at that time. The implication of lava reaching the surface was not clear. 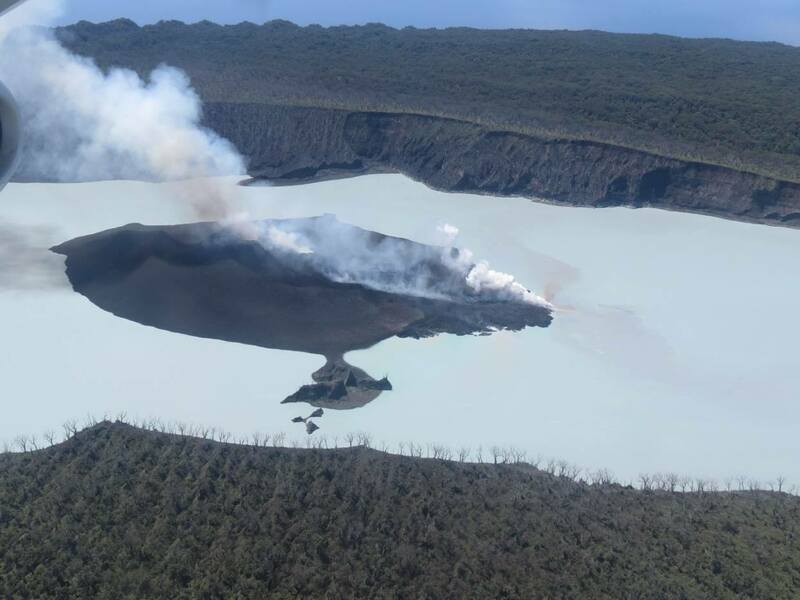 Observation flights on Saturday, 30th of September and Sunday, October 1, 2017 show that the activity at the volcano is only happening in one of the summit crater lakes (Lake Voui). 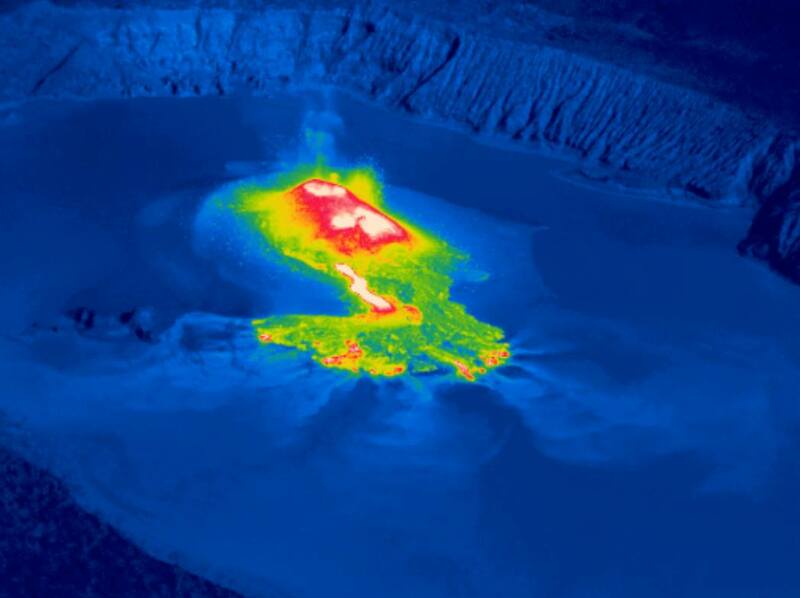 Photographs and thermal infrared images taken during observation flights show the activity consists of explosions and ejection of hot rocks, similar to what is seen and experienced at Yasur on Tanna Island. The local population could hear some of the explosions and see glow over the mountain at times. Aerial view of the volcanic cone that has formed in Lake Vui during September near the summit of Ambae Island. The active lava producing vents are near the centre of the island (red and white area). The white area is a lava flow. The red areas in the foreground is lava enter the lake. Satellite data and the observation flights now confirm there are small lava flows on the new volcanic island. They are reaching the lake. There is a small scoria cone also on the island and the number of vents can change daily. In the last 3 days this has ranged from 2 to 4 vents. This is very normal for a small scoria cone. The VMGD staff are able to view data from two seismic stations on Ambae and a web camera (http://www.vmgd.gov.vu/vmgd/index.php/geohazards/volcano). These transmit data 24 hours a day. The seismic activity reflects the new lava moving through the volcano and the lava reacting and mixing with the geothermal system (hence a slight increase). The seismic data does not show a large and sharp increase in activity at Ambae volcano. Scientists from VMGD will keep monitoring closely the activity, both remotely from Port Vila, thanks to a network of instruments on Ambae, and on the island as needed. Aerial view of the lava flow entering into Lake Vui. 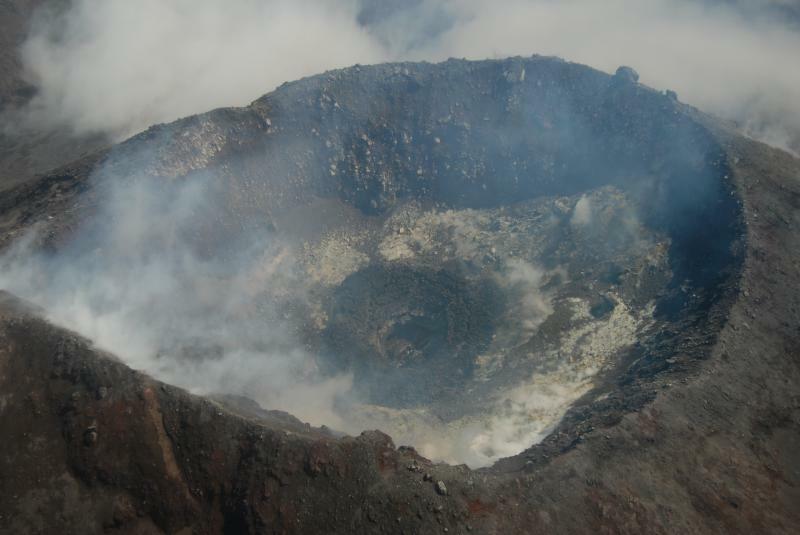 Ambae volcano is a very large volcano and is frequently active. In the recorded history there have been many eruptions, every 10-50 years and similar explosive activity every 100 to 150 years. All have been from the summit craters, except one recorded in 1670’s when a lava flow occurred near Ndui Ndui village. 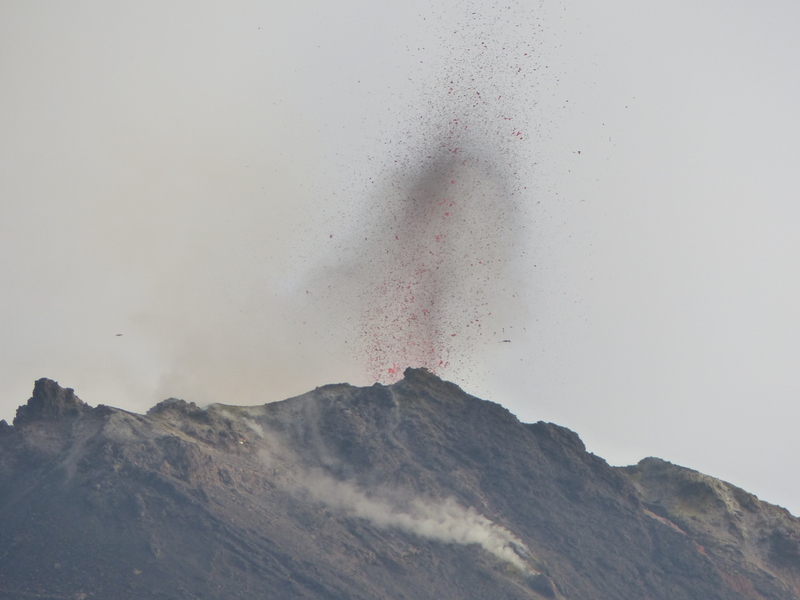 The current eruption is focused in the summit crater, there are no indications of activity elsewhere on Ambae Island. The new observations on the 30th of September and 1st of October confirmed that the situation is not developing further. As the activity is now more settled and focused only on the new island in Lake Voui, the possibility of a large eruption affecting the whole island is now looking less likely. 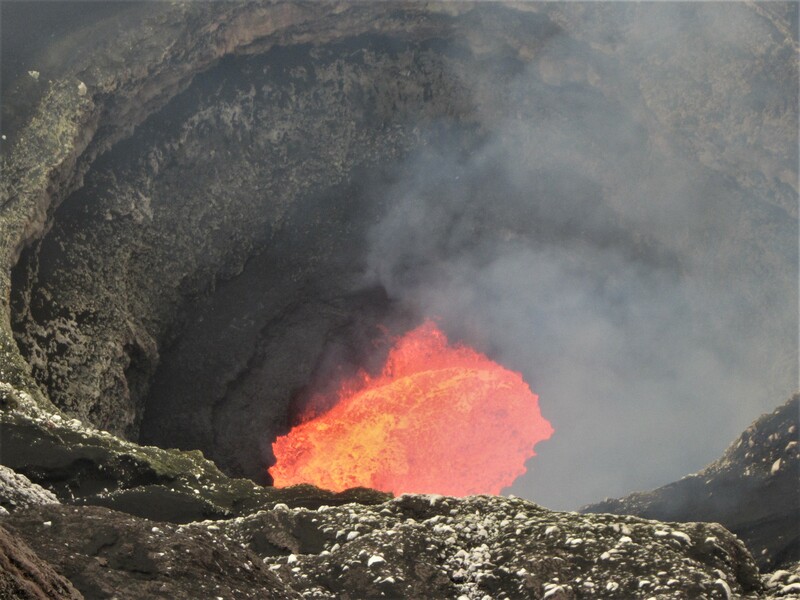 Lava effusion has begun and a new lava dome was observed in the summit crater in data from September 30. Slow growth is occurring and by October 1 the dome area was approximately 4,200 square meters. Lava effusion is typically confined to the summit crater at Cleveland, with the last significant lava flow (that extended to the ocean) occurring in 2001. The lava domes that have been erupted since 2001 have all been destroyed by explosive activity within weeks to months after lava effusion. 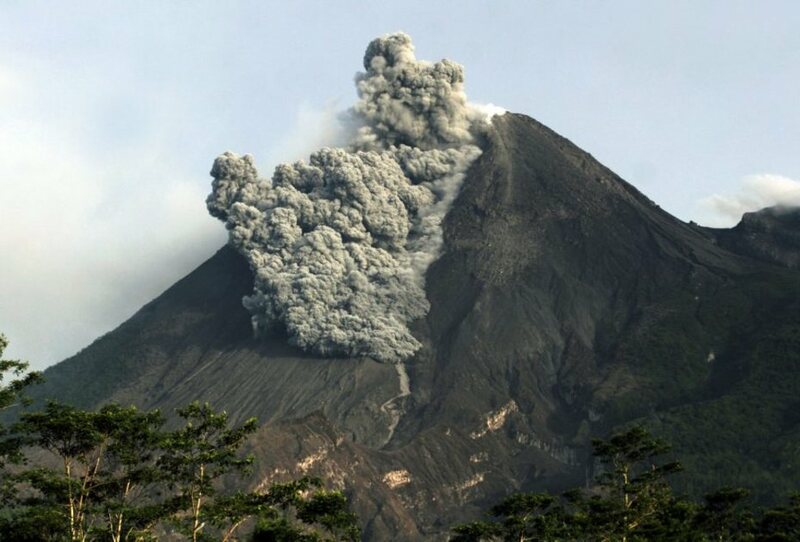 These explosions typically produce relatively small volcanic ash clouds that dissipate within hours, however more significant ash emissions are possible. There is no way to predict how long this lava dome will grow, or when it might be destroyed by an explosion. No significant activity related to lava effusion observed in seismic data (from the limited network on Cleveland) and no explosive activity detected in infrasound data over the past day. The eruptive columns of gas and ashes reached a maximum height of 3500 m above the crater (similar to the previous period). The dispersal of these materials occurred within a radius of more than 40 km, mainly east and north-east. The Mirova satellite system detected 7 thermal anomalies with values ​​between 2 MW and 18 MW of irradiated volcanic energy (VRP). 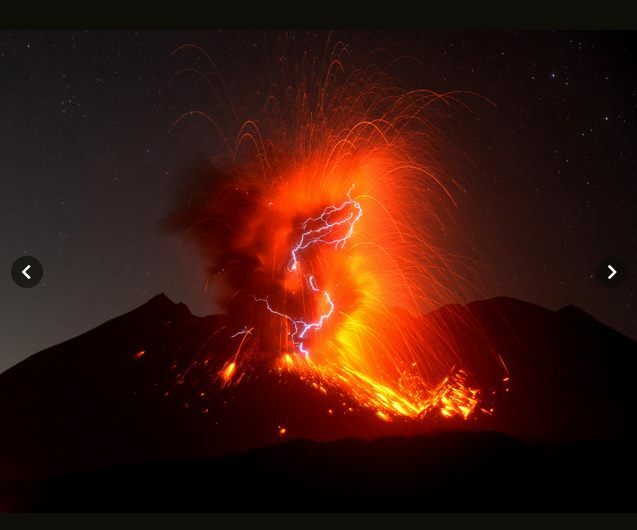 Eruptive activity maintained levels similar to those presented in the previous period. No major changes are expected in the coming days. 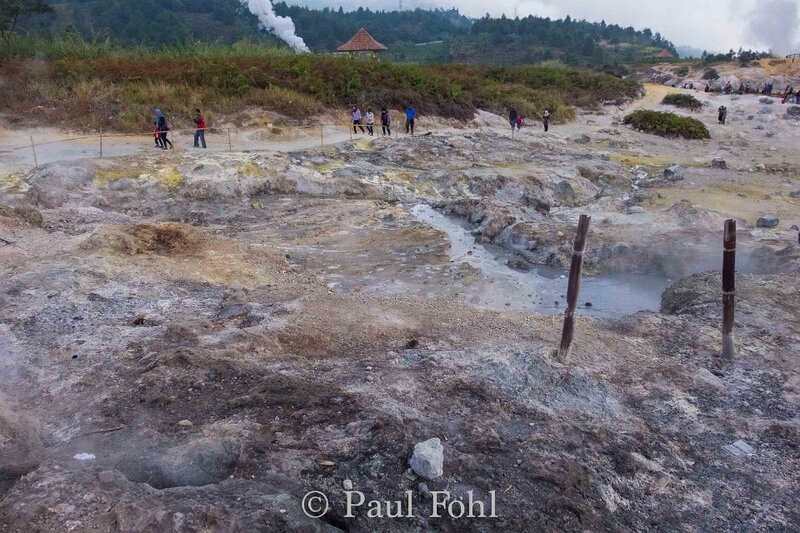 Following the phreatic eruption and activity of 2 July 2017 of the Sileri Crater, Kabupaten Banjarnegara, Central Java, activity had started to increase considerably since 13 September 2017, which was characterized by continuous tremors and an increase in temperature the water of the crater and the temperature of the ground around the lip of the crater. 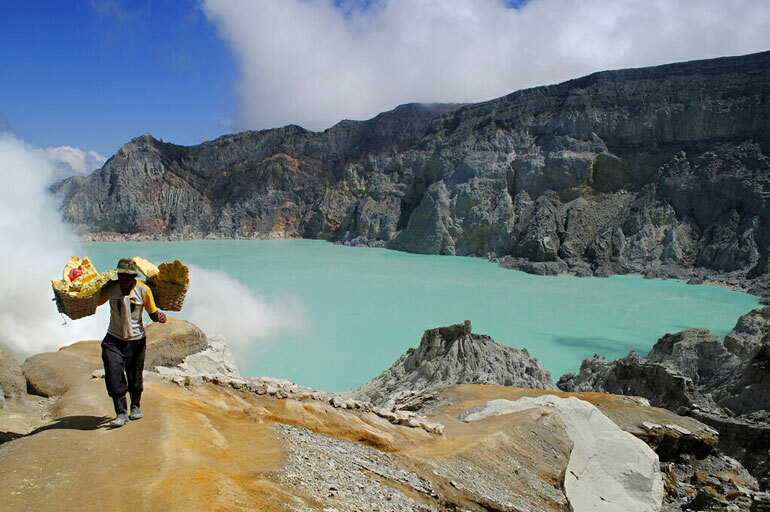 On September 14, 2017 at 10:30 pm, the PVMBG-Geological Agency had raised the status of Sileri Crater from Normal (Level I) to Waspada (Level II) and recommended that the community and visitors / tourists not approach 1 km of the lip of the crater. Desa Kepakisan and Dusun Sekalam had been evacuated. Since September 20, 2017, the energy of the tremor and the temperature of the water of the Sileri crater and the ground begin to decrease slowly. The PVMBG-Geological Agency, on October 2, 2017 at 12:00 pm, lowered the status of the Sileri Crater from Waspada (Level II) to Normal (Level I). In the normal status of K. Sileri, the Geographic Agency of the PVMBG recommends to the public and tourists not to approach the Sileri crater at a distance of 100 m from the lip of the crater.